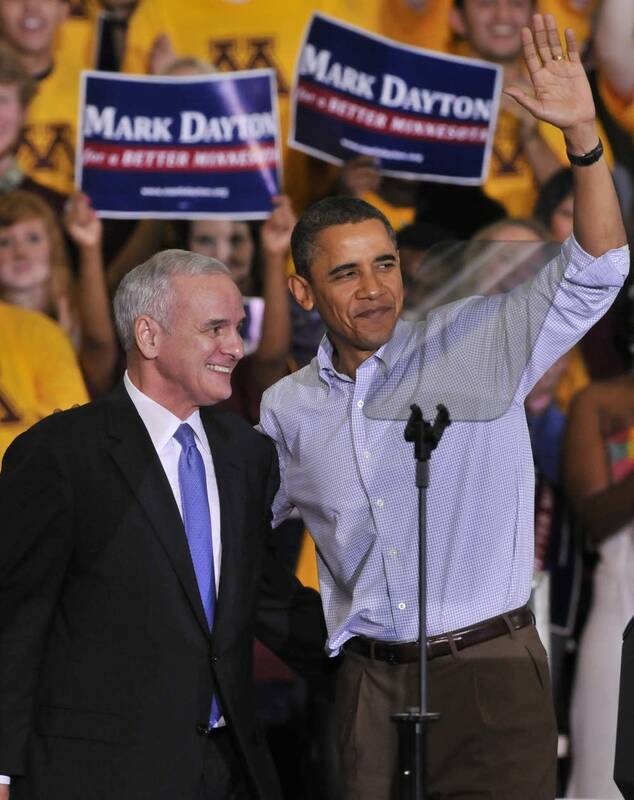 President Barack Obama told the crowd at a Minnesota rally Saturday to "defy the conventional wisdom" and put Democrats like gubernatorial nominee Mark Dayton in office. The two former colleagues in the U.S. Senate worked to motivate the Democratic base 10 days from an Election Day that could prove difficult for their party. 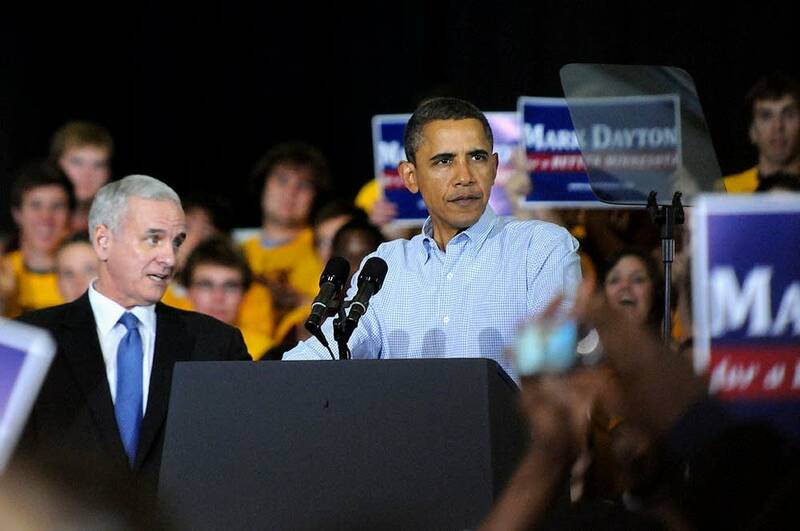 Obama said electing Dayton would keep Minnesota moving forward, praising him as someone who "spent his life fighting for Minnesota. And now I need all of you to fight for Mark Dayton." The president also put forth a defense of the Democratic record, from health care changes that extend coverage to more people to a financial industry overhaul meant to stop abuses on Wall Street. He said Republicans want to undo that agenda. "You can't have the keys back," Obama said of the GOP. "You don't know how to drive." 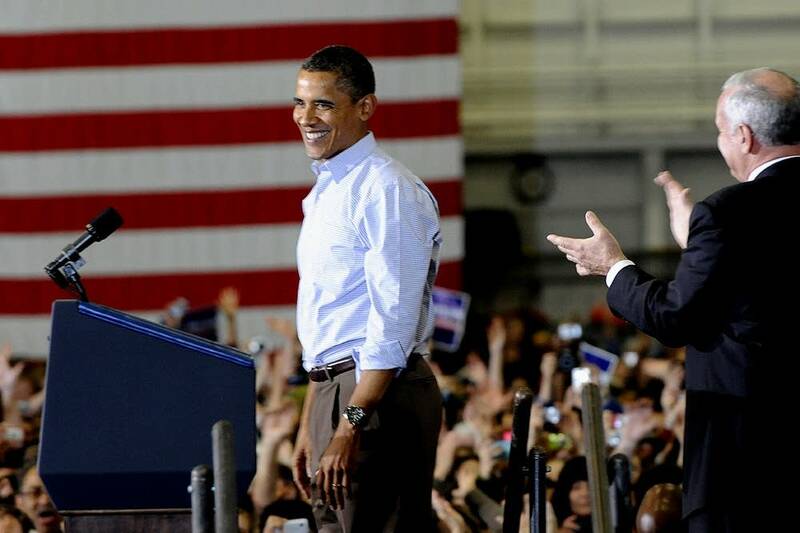 Obama was concluding a tour of states where Democrats have the opportunity to head off a Republican surge in the Nov. 2 election. In Minnesota, Dayton is running against - and ahead of - Republican Tom Emmer and the Independence Party's Tom Horner. 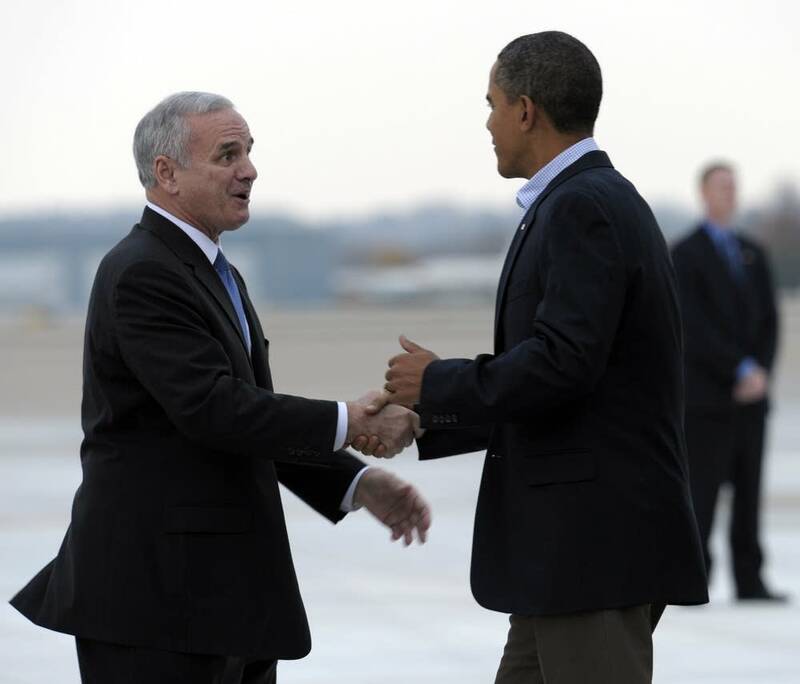 Dayton, usually reserved, got worked up as he pressed the crowd to push him and other Democrats to victory. "All of us need your help in the last 10 days," Dayton said, mentioning a late investment in the race of $1 million from the Republican Governors Association. "It's not from Minnesota, it's from the Big Oil companies, it's from the big drug companies. They don't care about Minnesota's future, they care about their own." 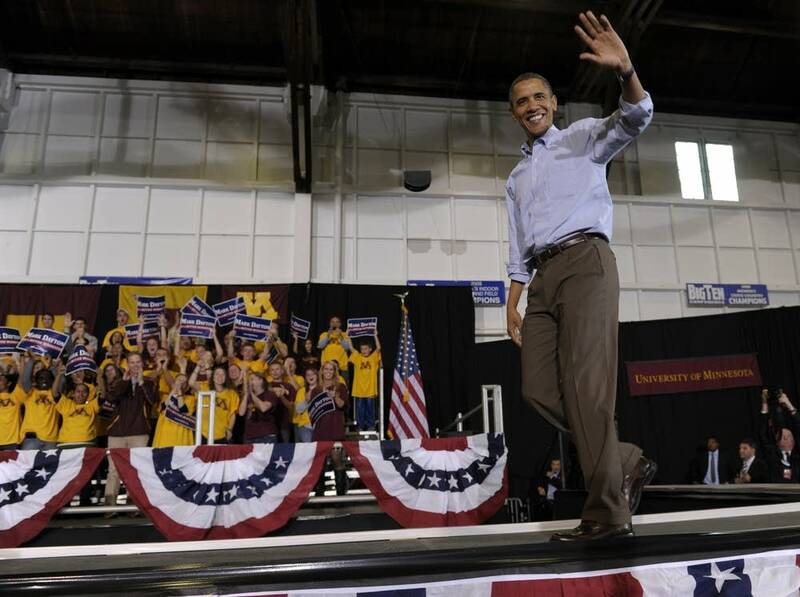 The university said 7,000 people packed the Field House to see Obama, and about 4,000 more watched from the Sports Pavilion across the street from the rally - two blocks from the stadium where the Gophers football team fell to Penn State. Officials said the line to see the president was nearly a mile long. "They talk about an enthusiasm gap. Look at this room," said St. Paul mayor Chris Coleman, surveying a crowd of several thousand. "Does this look like an enthusiasm gap?" Obama has been encouraging Democrats not to be complacent. Waiting to get into the rally, Nduba Namoonde, 48, was thinking the same thing. 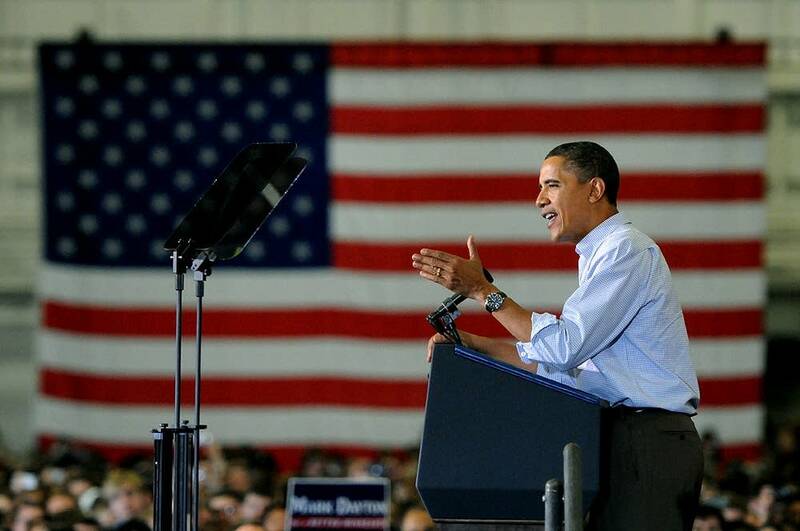 The financial compliance officer had poured himself into the 2008 campaign, knocking on doors and making calls for Obama in Minnesota and Iowa. "I don't see how someone who voted for Obama sits home two years later and doesn't vote," he said. His friend, Delta Air Lines ground worker Gladstone Natala, 50, said he thinks the mood is shifting as the election nears. "People underestimate his ability to excite people," he said of Obama. University of Minnesota student Mark Brandwein and other students wore T-shirts reading "Obama 4 Coach" and "Better than Brewster," the Minnesota Gophers coach fired six days earlier after a bad start to the season. "I'm more engaged since 2008. I've seen things progress. I've seen things changing," Brandwein said. "You can't give up now." Not everyone there was as enthused. St. Thomas University senior Erica Borgen, a 21-year-old graduating in May with a degree in elementary education, voted for Obama in 2008 and leans Democratic. But she considers herself undecided with this election rapidly approaching. Borgen said she's been turned off by negative ads she sees on TV and isn't enamored with her choices. "I don't trust either one of them, but I have to vote," said Borgen, who was leaning in Dayton's direction. While in Minneapolis, Obama also was helping raise about $600,000 for House Democrats at a fundraiser attended by House Speaker Nancy Pelosi and others. Republican Gov. Tim Pawlenty released a video in which he welcomed Obama to Minnesota with a tongue-in-cheek vocabulary lesson, introducing him to local expressions like "uffdah" and "yikes." "As in the sentence, 'The federal deficit was over a trillion dollars the last two years, and will be next year too. Yikes!"' Pawlenty said in the video posted on YouTube. Pawlenty has said he'll decide next spring whether to shoot for the White House. His second term as governor expires in January. Emmer, the Republican candidate for governor, appeared at a rally in Woodbury on Saturday with Republican Rep. Michele Bachmann. A few dozen College Republicans stood outside the field house with signs for Emmer and shirts ridiculing Obama. Taylor Fast, a sophomore at a public university in Mankato, was one of them willing to "get yelled at. That's what America is all about." He said the Obama visit does just as much to motivate Republicans. "I don't think people necessarily want to be associated with the president," Fast said. "We're ready for a different kind of change." 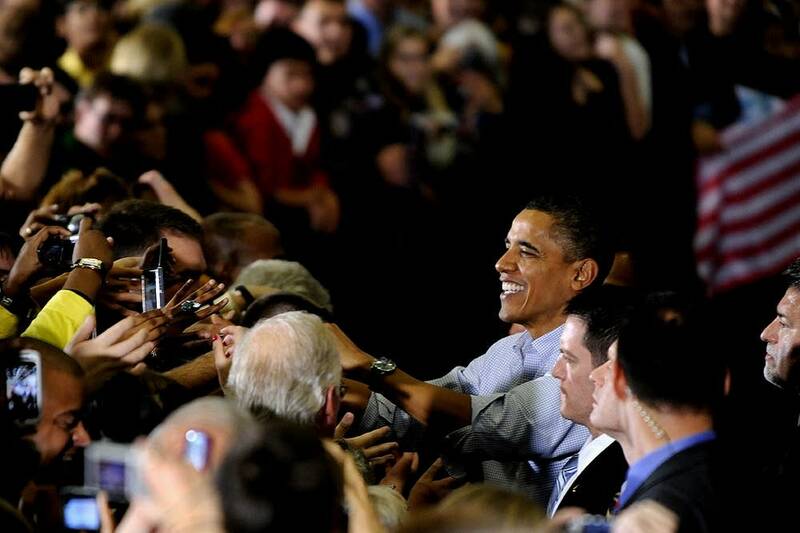 This is the fourth visit to the Twin Cities campus by a sitting president. George W. Bush came in 2002. Before that it was William Howard Taft in 1911 and Theodore Roosevelt in 1903.